Cosmetic trolley SPATEROS-BEAUTY S-16, buy at the price of 129 in Europe. Cosmetic trolley on wheels SPAteros-Beauty S-16 is quite versatile, can be used in clinics and beauty salons. 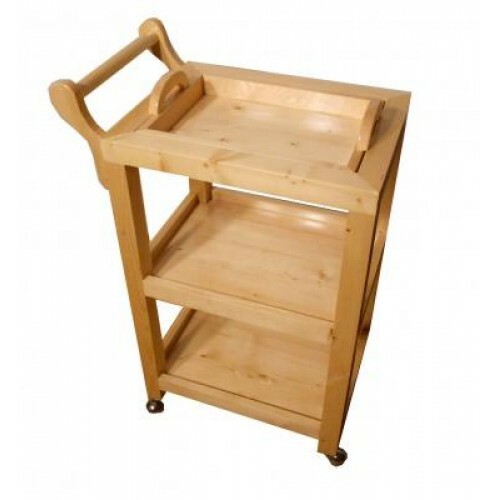 It is simple and compact, allowing you to place it even in a small room. Trolley is three-tier; its upper part is made in the form of a large removable tray, making it the most convenient, allowing you to carry the necessary equipment and working materials without moving the entire truck. The trolley is made of high-quality practical and natural materials, wood "dark oak". In addition, the trolley can move easily and silently due to the rotary wheelbase. It has a beautiful, neat shape, which makes it an elegant functional decoration of any beauty salon or office.